Come October 2016, all eyes will be on Latin America when the region hosts Habitat III, formally known as the United Nations Conference on Housing and Sustainable Urban Development, in Quito, Ecuador. [8 March 2016] -- Come October 2016, all eyes will be on Latin America when the region hosts Habitat III, formally known as the United Nations Conference on Housing and Sustainable Urban Development, in Quito, Ecuador. The choice of Latin America to host Habitat III is a strategic one. The region has nursed important innovations in terms of urbanisation and urban policy, including institutionalised participatory channels for master plans, city planning, and budgets. It has also been a source of progressive legal frameworks and land laws, such as Brazil’s City Statute and Law 388 in Colombia; equitable transportation systems; and expanding infrastructure in slums. Moreover, there is a lot of momentum in Latin America for Habitat III and for urban development in general. In preparation for October, stakeholders and experts from across the region have been gathering to reflect on the opportunities for the regional urban agenda. While the launch of a new urban agenda will have a global impact, it will be even greater for Latin America because of its high levels of mobilisation beforehand. Cities Alliance has supported many of these preparatory events, bringing together knowledge, expertise and experiences from the region and offering an international perspective. The process has also underscored how the Cities Alliance partnership adds value to Latin America: through knowledge and cooperation. Cities Alliance has a history of promoting innovations in Latin America, and the partnership is widely recognised as a key global player in the region with considerable expertise. And as a partnership with broad connections and a strong reputation in Latin America, Cities Alliance can bring members and partners together in a way that they haven’t experienced before. For example, Habitat for Humanity International (HFHI) and GIZ (the German Agency for International Cooperation) are two members of the Cities Alliance partnership that are very active in Latin America in advocating for a sustainable and equitable urban agenda and the Habitat III process, and we have worked with both to maximise knowledge sharing in the leadup to Habitat III. Cities Alliance worked with HFHI to support the 2nd Latin America and the Caribbean Regional Forum “Vivienda para la Vida” (Housing for Life) in Monterrey, Mexico this past May as part of the preparations for Habitat III. 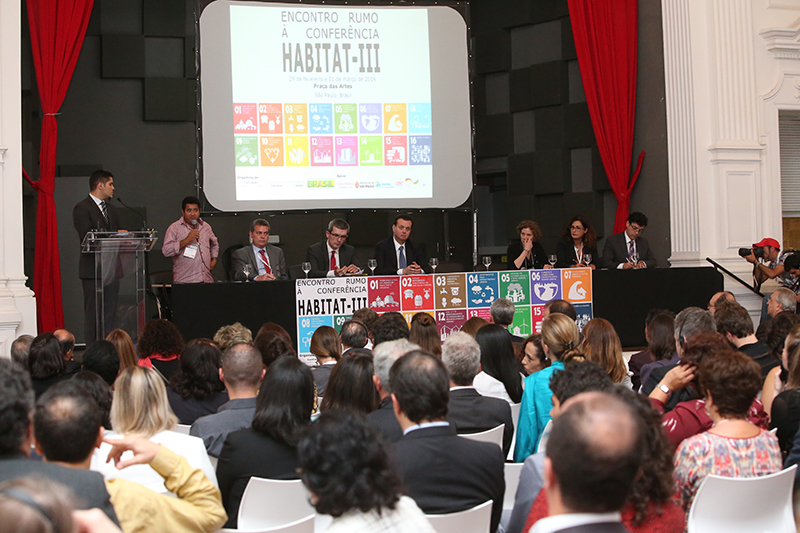 And at a November 2015 Habitat III thematic meeting on Intermediate Cities in Cuenca, Cities Alliance, GIZ, the Inter-American Development Bank and the Latin American Faculty of Social Sciences (FLACSO) cohosted a very successful side event that brought together experts from the region to discuss its contribution to Habitat III and the new urban agenda. Organising conferences and side events such as Monterrey and Cuenca offer more than opportunities for knowledge sharing. They are an important part of developing synergies and building trust among stakeholders in a region where international cooperation on urban development issues is still a relatively new concept. This is particularly important for Brazil and Chile, both Cities Alliance members that are in the process of transitioning from aid recipients to donors. They are no longer receiving aid, but are not yet recognised as donors. At the same time, Latin America is a rich source of knowledge resources, and Cities Alliance provides a flexible platform for knowledge sharing and working together. For instance, the partnership supported (and participated in) a series of joint dialogue between Brazil and the European Union to exchange technical know-how on a range of sectors and issues, including on the role of national governments in supporting cities for the implementation of the new urban agenda. On a regional level, Chile and Brazil are active members in the General Assembly of Ministers of Housing and Urban Development of Latin America and the Caribbean (known by its Spanish acronym MINURVI). Cities Alliance has participated in the 2014 and 2015 meetings of MINURVI, consulting on the Assembly’s Habitat III report and providing suggestions and recommendations. The Cities Alliance Latin America and the Caribbean (LAC) team has also fostered cooperation between Chile and Brazil through the Cities Alliance Joint Work Programme on Gender Equality, a platform for promoting the role of women in development and ensuring that gender equality is mainstreamed across Cities Alliance activities. Both countries were interested in finding ways to strengthen the gender approach in national policies, and Cities Alliance facilitated hiring a consultant to study policies and provide recommendations. The findings will be included in the Habitat III process and used as input for international advocacy. They will also be presented at the next meeting of MINURVI, which will take place before Habitat III. We have also fostered cooperation with other members of the partnership. For example, Chile has been working at the community leader level to promote exchanges among community leaders to discuss how projects can include a gender angle. The Cities Alliance LAC team facilitated a connection with Shack/Slum Dwellers International (SDI), which has extensive experience in this area. SDI and Chile are now working together to discuss now to improve gender in projects and perspective among community leaders, many of whom are men. The preparation process for Habitat III offered Cities Alliance a unique opportunity to get input and support from key members and partners for a new strategy to guide the partnership’s activities in Latin America. As a result, we have crafted a regional strategy that is connected to both regional demands and global trends, and promotes synergy among key members as much as possible. The Cities Alliance Latin America and the Caribbean regional strategy is based on two important pillars: Knowledge sharing and advocacy, both in the region and internationally. Germany, a key player in the region, has a strong strategy for Latin America that sees the regional countries as equal partners in overcoming policy and inequality, and identifying key solutions that can be shared. The Cities Alliance strategy draws on this approach and targets key stakeholders at the national and community level and through south-south exchanges. Technical assistance. There is still a need for technical assistance in Latin America, not so much funding but rather Cities Alliance’s expertise, know-how and strength of membership to add value to projects. There is a strong demand for countries to learn from each other, strengthen national policy, and institutionalise the urban agenda. The Cities Alliance LAC strategy was soft launched on 1 March at a regional Habitat III conference in São Paulo, which was also supported by Cities Alliance. Cities Alliance’s Latin America and Caribbean presence and its regional support for Habitat III is driven by our office in São Paulo, Brazil and its dynamic head, Anaclaudia Rossbach, Regional Adviser for Latin America and the Caribbean. A native of São Paulo, Ms. Rossbach has over 15 years of experience in the housing sector from all different perspectives – as a researcher, public sector staff, government adviser, and consultant for the World Bank, universities and think tanks. She supported the government of Brazil on its National Housing Plan and worked as the coordinator of finance and administration for the São Paulo Housing Department. She is also the founder of the NGO Interação (International Network of Community Action), SDI’s affiliate in Brazil. In 2015, Ms. Rossbach was selected as a Special Expert for the Habitat III Policy Unit #3 on National Urban Policies. Driven by UN-Habitat, these Policy Units bring together high-level expertise to identify good practices, lessons learned, and policy recommendations on urban issues. Each unit produces a document in their specific area that will feed into Habitat III and the so-called “zero draft” document of outcomes. The National Urban Policies Unit met twice in 2015, organised by UN-Habitat, CEPAL (United Nations Economic Commission for Latin America and the Caribbean) and OECD. Ms. Rossbach led a working group on key stakeholders along with representatives from DFID, Colombia and Argentina, and participated in the Policy Unit#3 Draft Framework Document. She also attended a final meeting and write shop in London on 25-26 February 2016 that generated a paper that will be submitted to the Habitat III Secretariat.